So far I think everyone has been great! I appreciate the discourse and discussion. I think it's safe to say that we'd all agree that this is not a super straight-forward ID. 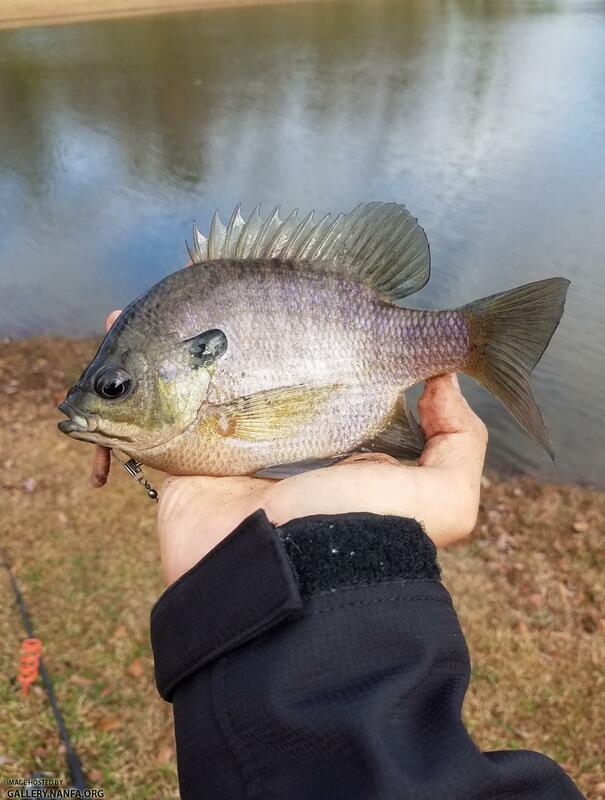 Here is a picture of a bull Bluegill caught in the same pond if it helps. 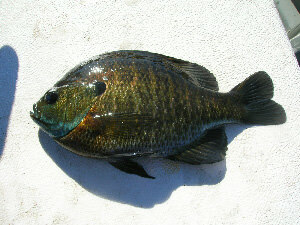 Somebody needs to post a male sunfish pic with jet black pelvic fins. If somebody gets butthurt about sunfish ID speculation, it is their own problem. Speak your mind. Everyone is being civil here. This isn't Facebook. I disagree. I find your posts informative, enjoyable, and generally non confrontational. Seems civil. Maybe not the definition of. Now don't become less civil now, just to spite me Jim. Well you know you could be one of those arrogant academics! I ran into one of those at Purdue! Got all bent out of shape because I introduced one of his colleagues by his nick name at an aquaculture conference. It was like the world ended as we knew it. In retrospect I should have responded with, "And who the hell are you again?" Did a presentation later on another date as president of the aquaculture association and one of the Purdue grad students said, "We hear you don't do much in aquaculture." Purdue got 20 million bequeathed and was supposed to use some of it to come up with an aquaculture facilitator for the state. Never happened and they didn't even have the decency to tell us why not. As you can see I'm not that impressed by Purdue. Aquaculture is very low priority there among the administration although there are good people there. Amazing isn't it for something that is supposed to be the fastest growing form of agriculture in the world? Naw! Did you shop that Michael? Well, someone posted one. And it is a spotted. That looks unreal. I'm not civil either. I'm right and everyone else is wrong. Obviously. Pic attached of some monsters out of my pond in Lexington. May not be "jet black" but they are black pelvic fins and those are pure bluegill. I know you can only see one set of pelvic fins, but it's on a big male. (hopefully I'm allowed to post this type of picture of fish on a stringer, if not mods please delete and let me know). Naw! Did you shop that No? Well, someone posted one. And it is a spotted. That looks unreal. No sir... that is an old picture... there may even be an old thread on here where I asked what was going on the first time I saw this. This fish was in an aquarium for a long time looking like a 'regular spotted' before he did that one day. Fully acceptable. Some of us eat fish too. Some members preserve them for collections. As long as it is legal, and in good taste, no worries. That is awesome Michael. Momentarily, I thought you were pranking, but realized it was likely the real deal. That is very striking. Neat stuff. As a fish taxidermist that airbrushes the colors back into the skin of a mounted fish, if I painted a fish that light with such dark pelvic fins in bold contrast, no one would believe it was natural! That is till what I mean by jet black. Those pelvic fins are part of the display and they stand out to my eyes when males are being sassy.